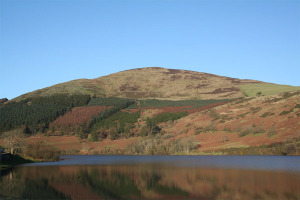 Fell running is the sport of running off road, over upland country where the gradient climbed and the terrain traversed is a significant component of the difficulty. The name arises from the origins of the English sport on the fells of northern Britain, especially those in the Lake District. Many runners can manage the uphills, which demand strength, effort and determination but little more. It’s on the downhills where a fell runner’s special talent is obvious. Maybe it’s a matter of leg-eye coordination, maybe it’s to do with fast twitch fibres in the feet, or maybe it’s all about bravery to the point of foolhardiness – the fact is, you will soon know if you have enough of what it takes; one race should be enough. You’ll find yourself either teetering nervously over the uneven ground or bounding down the hillside like a gazelle. Above all, don’t be intimidated; it’s not as hard as you think! Modern fell running trainers use light, non waterproof material to eject water and dislodge mud after traversing boggy ground. While the trainer needs to be supple, to grip an uneven, slippery surface, a degree of side protection against rock and loose stones may be provided. Rubber studs have been the mode for the last two decades. 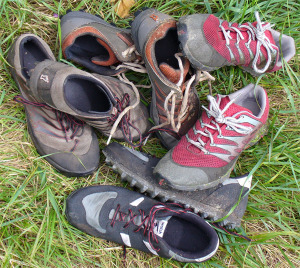 Walshes are extensively used by many UK runners, especially in the Lake District, where their sole pattern gives excellent grip on steep grass. Shoe manufacturers such as Inov8 and Montrail are also leading the chasing pack to try to make better and better shoes to compete with Norman Walsh’s design. Road shoes with a deep-lugged, aggressive outsole are ok to start with but they do not provide the same, high level of grip as the fell shoes described above. Waterproof whole body cover (including a hood or hat). The above equipment is usually carried in a bum bag although small rucksacks are sometimes used too. The above requirements constitute “best practice” and are mandatory at all Long and Medium races. In the event of settled fine weather, the organiser may decide to waive some of the above requirements for Short races. Organisers are obliged to ensure that whatever requirements they specify on the day are met and check kit at registration, followed by random checks before and after the start of the race.